Northern Pakistan, bordered by China to the north, Afghanistan to the northwest, and India to the east, is said to contain the most breathtaking sights in Pakistan. It is there - nestled between five of the world's highest mountain peaks - that the northern tribes can be found. They are the original inhabitants of the area. The northern tribes include the Badeshi, Burushas, Kolai, Punjabi Pahari, Shina, Shumashti, and Kho. Before the conquest of the Pushtun, their ancestors occupied Dir, Swat, and other areas of northern Pakistan. The British gained control of the region around 1895, but left in 1947 when Pakistan became an independent nation. Yet, the Pushtun have dominated the various ethnic groups of this region for years, either buying their land or forcing them out with violence. The northern tribes are known as quiet, peace-loving, and brave people. Most of them live in the upper valleys, where farming is very difficult due to the dry, rugged mountain terrain. The opening of the Karakoram Highway, which follows the Indus River Valley, has had the greatest economic impact on this region. The communities of the northern areas are located in the narrow valleys formed by the tributaries of the Indus, where irrigation is possible. Since the Indus River flows through a steep rocky gorge, it is useless for irrigation. The people there are primarily farmers and shepherds. Grain is planted on terraced fields and oxen are used for plowing. In the remaining area, which is very dry and irrigated by glacial runoff, they raise barley, wheat, maize, millet, and rice, supplemented by potatoes and a variety of other vegetables. Since they can only grow one annual crop, the people rely on the "transhumant" herding of their dairy goats and cattle. This means that they transfer their livestock from one grazing ground to another with the changing of seasons. During the summer months, they leave their permanent villages and drive the cattle, goats, and sheep to alpine pastures. 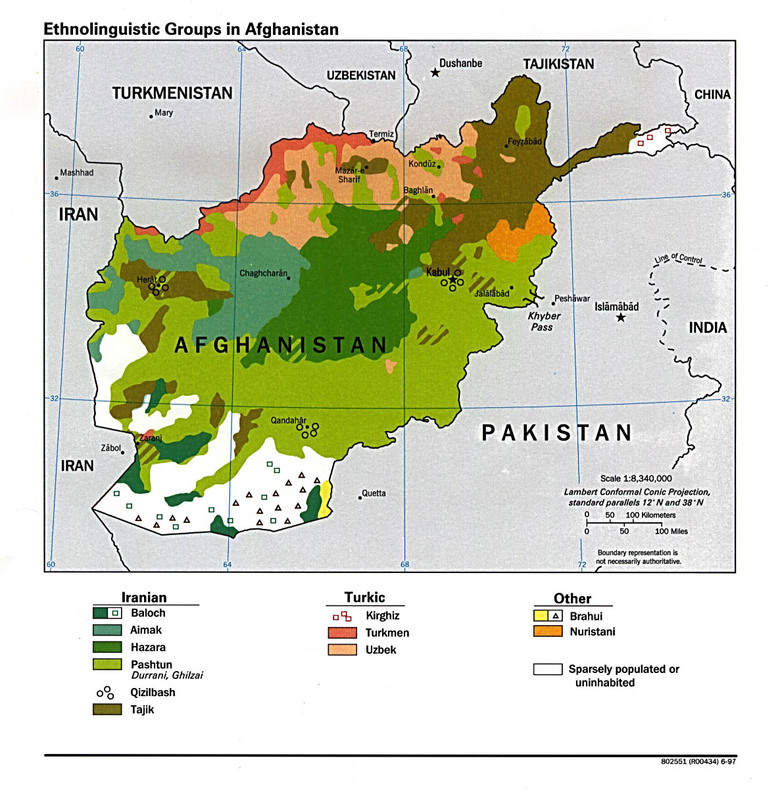 Mountain ranges and political borders tend to isolate the ethnic groups that live in the northern areas. Most settlements exist as small independent communities, located at altitudes between 2,000 and 14,000 feet. Families usually have houses in four or five different locations at the higher altitudes. Only in the winter do they live together in their compact villages, which lie along the rivers. 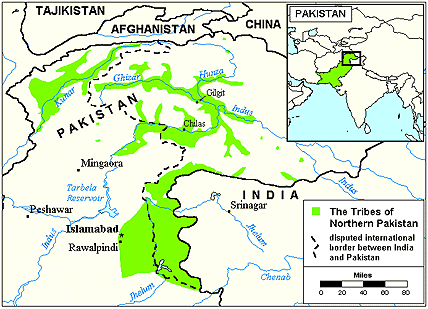 Prior to the twentieth century, the northern areas of Pakistan were semi-independent. They were under various local rulers such as the Mehtars of Chitral, the Wali of Swat, and the Mir of Hunza. Today, these communities are under Pakistani administration, governed by a federally appointed district commissioner. Ever since the abolition of the Mehtars and other local rulers, the northern tribes have undergone many social and cultural changes. Although the extensive road-building project is providing them with greater access to the mainstream of Pakistani society, it is also encouraging the influx of Pushtun from farther south. Among the smaller ethnic groups, there is a growing resentment toward the Pushtun, who dominate the district government. Some ethnic groups, such as the Kho, are divided into three social classes: the upper class, ruling nobility; the middle class landowners; and the lower class tenant farmers and hired laborers. Most of the tribal groups in the northern territories practice endogamy, meaning that they only marry within their own group. Their societies are also patrilineal, which means that the line of descent is traced through the males. The women are not secluded, as is customary among many other Muslim groups, because they are needed to help with the farm work. Centuries ago, the area of northern Pakistan was primarily Buddhist. Later, Buddhism was replaced by Hinduism. However, around 1000 A.D., the Islamic faith spreadh to the region. Today, the vast majority of the people are Sunni (orthodox) Muslim. Traces of traditional, pre-Islamic beliefs still linger in a few areas. Some of the tribes practice shamanism. They believe that there is an unseen world of gods, demons, fairies, and ancestral spirits. They depend on shamans (priests or priestesses) to cure the sick by magic, communicate with the gods, and control events. The northern tribes have many health problems due to poor water quality and poor nutrition. Portable drinking water, sewage disposal, and drainage facilities are available for a small segment of the population. Dentists and doctors are desperately needed among these groups. There is a People's Works Program (PWP) in the region, but it can not meet the immense needs of the communities. Educational facilities are also lacking and the need for qualified teachers is great. Some of the tribes, such as the Burushas, still have an unwritten language and most of them have no missions agencies working among them. On the whole, the Islamic Republic of Pakistan is closed to Christianity and is opposed to the presence of missionaries there. * Pray that the Lord will raise up laborers who are willing to invest long term service to the tribes of northern Pakistan. * Pray that the Pakistani Christians will gain a vision to see the people of the northern areas reached with the Gospel. * Pray that the Pakistani government will be favorable toward Christians and will allow them to freely preach the Gospel. * Pray for cooperation among missions agencies that are focusing on these tribes. * Pray that God will raise up linguists to translate the Word of God into each of the tribal languages. * Ask God to send medical teams and humanitarian aid workers to minister to the northern tribes. * Pray that strong fellowships of believers will be birthed among each of these tribes. 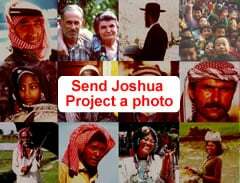 * Pray for the availability of the Jesus Film in the primary language of this people.View Shumashti in all countries. Location in Country: Konar province: Konar valley west side between Pech valley and Jalalabad city.